and, with it, something analgesic mists my mind. and, in it, something anaesthetic mutes my mind. Of course, they're not the same, but similar. Each poem in the sequence starts with a variation on these lines. In fact, it goes further, as each line is a variation on the same line in the other five poems in the sequence. This has at least two effects; first it disorients the reader, and make them question the objectivity of the verse and its relation to the external world; it somehow weakens the link between the poem and what it purports to be describing and turns the poem into a self-sufficient verbal object. Second, the repetition over a longer sequence, lulls the reader into a state in which they're involved in an experience which is purely linguistic (these two things are, of course, related). "'Construction with Stencil' is among the poems which, to some degree, are put together using translational symmetry.' In 'Melodies for the Meanwhile' it is rotational symmetry which is used." The pan of pilchards steaming on the stove is real. The milk jug's real. The phone is real. My gut-ache's real. The midges at the edges of my mind are real. The effect of this is to create an atmosphere of existential uncertainty, and the continuation of this text over thirty-five pages induces an almost trance-like state in which, as readers, we're unsure of what we're reading; just as the poem's narrator is unsure they'll be heard. So the poem embodies the statement about its own uncertainty. There were times, re-reading this collection, when I thought the repetition went too far; I didn't want to read repeated phrases, with minor variations over many pages. But perhaps the risk of boredom is part of the point; the poems tend to keep the reader at the surface, and they frustrate the habitual need for "interesting" subject matter in favour of focusing on the words themselves. And despite this quibble, I can say that most of the time, the poems in this book gave me pure pleasure; they’re full of playfulness, wit and verbal music, and the repetition and variation have a hypnotic effect. 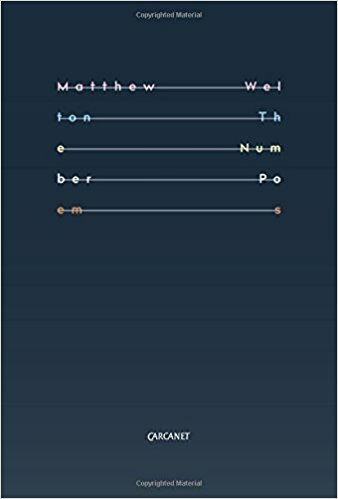 Welton’s first book was a fresh and interesting addition to current poetry, but his second, seemed to not follow up this promise in a convincing way, despite having moments of considerable skill and accomplishment. This third book however is a more substantial achievement, maybe because the poet gave himself up fully to the formal, number-generated method of construction. What Welton does which seems to be quite original, is to take the language of the subjective lyric mode and put it into mathematically-generated texts in a way that has "made it new"; there's considerable pleasure to be gained from this, and it's something that is not usually found in what is usually called “innovative” writing.